Many times we have been thinking about changing your Network provider feeling that the features given by the other provider are better suited to our needs that the one’s which we are using. 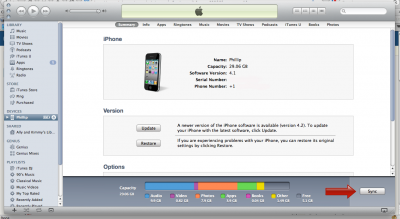 That is when the need to transfer the Data you have on your iPhone 4 to a new iPhone 4 arises. If you have already exchanged your iPhone with a new one in your Apple iStore then you will be aware of this process because you would have already done this to transfer you data from your old iPhone to your new exchanged one. 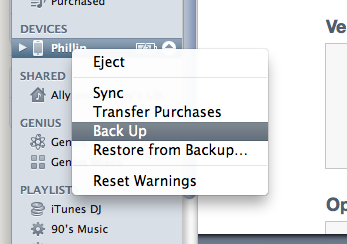 Settings into an iTunes backup for you. You should have both your iPhone’s Old one and New one with you at the same time. Next you have to Sync your iPhone with iTunes, mostly the Sync process will start automatically. If the Sync is not started automatically then you should Sync your iPhone by pressing the Sync button seen on the Lower Left of your Page. 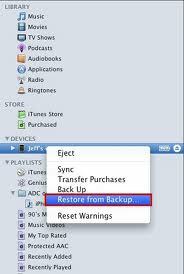 After Syncing your iPhone to your iTunes you should Back Up your iPhone. To Back Up your iPhone you should Right click on your iPhone name seen in the Left side panel. After the Back Up is complete you should Disconnect your old iPhone from the computer and connect your new iPhone in the same place. Once the restore process is done your iPhone will reboot. And when iTunes detects it again it will start to sync back any apps and games your old iPhone had installed. It might take some time to do all that has to be done by iTunes so its better you don’t do anything with your iPhone till the whole process is complete. With this process you can easily transfer your data from your Old iPhone to your new iPhone.